First off I've only been playing Eco for a few days now. I started a private server for a friend and I and we decided to go with Alpha 5 version 3. We have no experience with how buildings work/worked in previous versions. I built a pretty good sized building out of mortared stone with a stone roof and a brick chimney on top it's 9x10 and 3 blocks high plus a stone roof (on top of the 3 high walls). Now that I built the building i'm trying to place the bakery oven inside and every time I try it causes the server to crash. I'm I not building it tall enough or something or is it just bugged? Going to attempt making it one more taller and see if this helps in the meantime. EDIT: This didn't work either :\ going to try replacing the mortared stone walls with bricks maybe? If the server crashes there's a Dump folder where the logs are, those should be provided for properly reporting the crash. 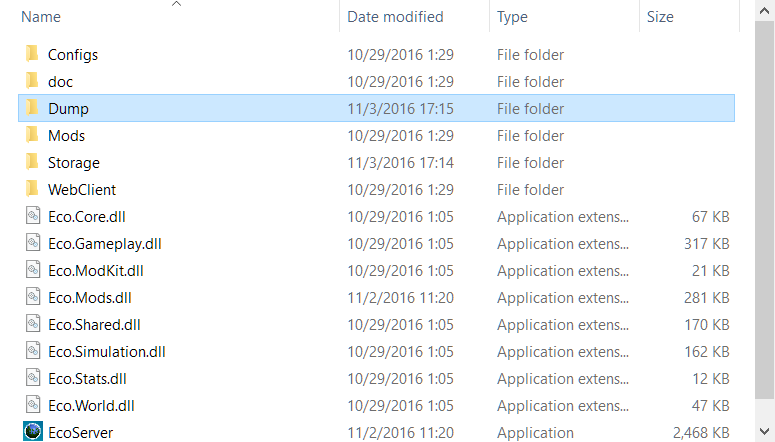 Having a hard time finding the Dump folder, If you could help me locate it i'd be glad to post the logs.